Book a winery tour to experience Nashville's first fully-functioning urban winery! See where fresh grapes are delivered from all over the world and processed in our winery. Smell the sweet aromas of winemaking in the making from our oak barrels and steel tanks, used for mixing and aging. Taste locally made wine produced right here in Nashville, Tennessee by City Winery! You might even get to meet Local Winemaker Bill Anton! Each tour is finished with a tasting flight of three of our house-made wines and a delicious cheese plate from our Head Chef. All vegetarian, no substitutions. As a parting gift, all guests of our winery tours will receive a complimentary City Winery coupon valid for a one (1) free glass of tap wine with purchase of any entree in our Barrel Room Restaurant & Wine Bar, as well as the opportunity to purchase any of our retail wine at 20% off! Must be 21+ to redeem. Tour prices begin at $25/person. 48-hour advance notice required. 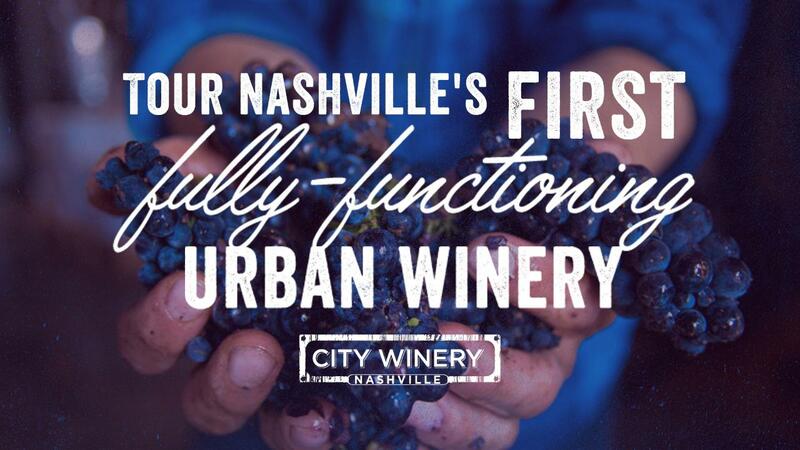 For questions, visitcitywinery.com/nashville or contact nashvilleconcierge@citywinery.com. Cheers!